Crescent Heights pays homage to the history of each location as well as its distinctive character, connecting design and art to the native environment. Crescent Heights engages both world-renowned and emerging artists to create interior and exterior artworks for our buildings. Art is introduced in a variety of ways, from public plazas and installations to curated galleries in lobbies, amenity spaces and interior corridors. NEMA San Francisco’s art plaza illustrates the depth of thought and community impact of just one of our public art projects. The plaza brings California’s natural landscape into the urban context, creating room to breathe within the city bustle. Designed by Topher Delaney and named "Promised Land" for its meditative spirit, the plaza is layered with cartography-inspired artwork, monumental stone sculptures, and enveloped with beautiful grasses and trees. 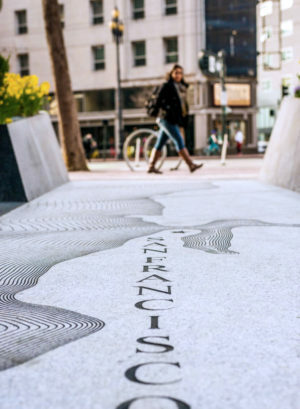 The concrete paving is a map scored with the grid of San Francisco streets alongside two vector-shaped pathways made of granite sourced from Northern California’s Raymond and Academy Black quarries. Two 20-foot-high monumental blocks of stone are inscribed with barcode spelling out “Promised Land”; a regional species of Aspen trees are planted throughout the plaza to create a green corridor to the building’s entrance. 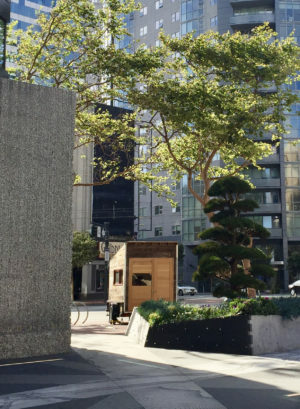 With support from the Mayor’s Office of Civic Innovation, the San Francisco Planning Department’s (LIZ) Program, and the SFAC, Studio 1 was installed on the sidewalk directly fronting the plaza. This 65-square-foot “off the grid” solar powered art studio, mobile work space, and micro residency center was built with reclaimed materials on the back of a flatbed trailer. The series of artists who alternated short residencies in the Studio 1 for six months included choreographers, performance artists, and digital media artists.